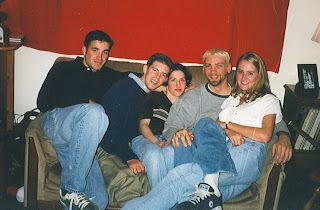 We did all kinds of crazy stuff together….We even did some illegal things I think… like filling a hot tub with Ramen noodles… oops, sorry Raintree management, we were stupid teenagers! There is another infamous hot tub story from Raintree and if you know Ben and me or have ever spoken to Daniel in the presence of Ben and me, you’ve heard it. There are so many fun stories with these guys, but I remember many late nights and lots of silliness. We died Daniels hair blue once. We spent an entire evening flashing pictures on a camera with no film, but testing what images were left on our retina from the flash of light. We eventually learned that Courtney was an amazing violinist. We stayed up late and watch surgeries on the discovery channel. We went to Dennys at all hours for chocolate shakes. Daniel and I went to almost every movie that came out the year we lived there. One of my favorite things was jam session with Brooke and Ben – Brooke on the guitar and Ben on the harmonica and vocals as they sang songs they had made up as teenagers or right as they sang. One of my favorites was one about going to school at UVSC – I wish I could get my hand on that song now :). These are people who are my platonic soul mates! Meant to meet and meant to be friends for life and longer. After they went on missions they all came home and we still hung out. I saw more of Ben and Daniel at that point then Brooke, but he’s still a part of the gang for sure (like how I make myself part of the gang when I’m sure as Brooke tells it I was more of the outsider). 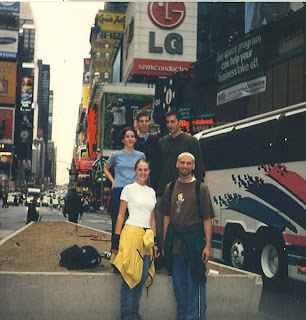 We all rollerbladed through NYC together in 1999 and I’m not bitter any more about the guys leaving me behind in the seedy ghettos of Trenton, NJ at 2 in the morning. Ben and I even drove cross country once. Some of my favorite memories are laced with images of these guys. I love them very much and am so glad that we were able to form those bonds of friendship so long ago. These guys are all married with beautiful families now and I rarely get to see them, but I know that they are some of the best people I will ever know. I guess the point of this post is just to say how great it is to see someone who you haven’t seen in a long time (4 years or more for Ben and me) and to instantly reconnect, instantly know this is someone who loves and supports me, and instantly recognize the imprint they have left on your soul. I recently was talking to another, more recent friend, and said something to the effect of ‘now and forever there will be pieces of you in the fabric of who I am’ (funny to quote myself I know). It’s just that’s how it is for me. I’m not great at small talk. I’m not one of those people who are instantly friends with everyone they meet, but if I become your friend. I will be your friend forever. You will influence who I am and become and I hope I can do the same for you. When someone is important in my life and I take the time to get to know them they literally change who I am and I love them for that. They forever become a part of who I am. If you’re one of those people – and you’ll know if you are – Thank you! I love you!